Enjoy serving brunch or sitting around this table sipping drinks in the sun as you relax the day away in your outdoor retreat. 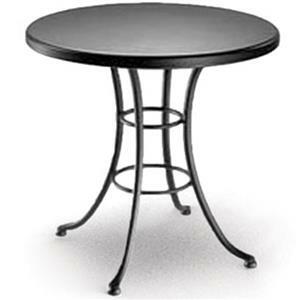 The splayed legs on the steel base and an umbrella hole gives this piece contemporary style that you are bound to love. With this piece added to your outdoor retreat, you can't go wrong. 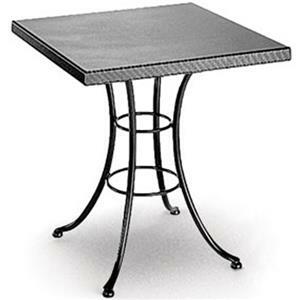 The Embossed 36" Cafe Table with Square Top and Umbrella Hole by Homecrest at VanDrie Home Furnishings in the Cadillac, Traverse City, Big Rapids, Houghton Lake and Northern Michigan area. Product availability may vary. Contact us for the most current availability on this product. Transform your outdoor space into the relaxing getaway you always dreamed it would be when you add this contemporary Embossed collection. Choose from multiple size of square or round tables in cafe height or bar and with or without umbrella holes to find the ideal one for you. Splayed legs and metal tops make this collection a one of a kind one that you are sure to love in your yard. The Embossed collection is a great option if you are looking for Contemporary Outdoor Furniture in the Cadillac, Traverse City, Big Rapids, Houghton Lake and Northern Michigan area. Browse other items in the Embossed collection from VanDrie Home Furnishings in the Cadillac, Traverse City, Big Rapids, Houghton Lake and Northern Michigan area.